This compact versatile KitchenAid countertop oven features an onyx black exterior, non-stick interior, a stainless steel broil pan, and a stainless steel drip ban, both are dishwasher safe. 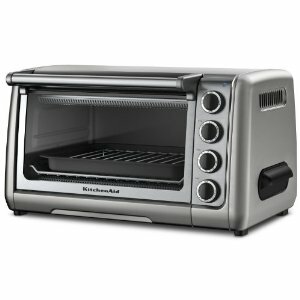 This countertop oven by Kitchen Aid takes up less space and still features bake, broil, and toasting functions with a 60 minute timer. This KitchenAid oven features variable temperature control up to 450° making this is a wonderful addition to any kitchen.